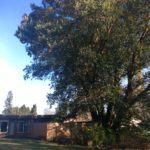 The large Pacific madrone tree overlooking the Yang house was designated a City of Corvallis Heritage Tree in 2016. It is said by the Corvallis City forester to be the largest madrone in Corvallis, and the second largest madrone in Benton County; the largest being in an inaccessible rural area. The tree is located at a house designed and built in 1950 by Corvallis architect Edith Yang as the personal residence for herself and her husband, Professor Hoya Yang, Ph.D. Their home, in the style advocated by Frank Lloyd Wright, was designed with the intention of opening up interior spaces and bringing the outdoors in. Mid-century houses utilized then-groundbreaking post and beam architectural design that eliminated bulky support walls in favor of walls seemingly made of glass, which made the landscaping integral to the design. The Yang Madrone and other nearby madrones were planted circa 1950 by Hoya in their yard, designed to complement the new Mid-Century Modern home his wife had designed. Edith received her Bachelor of Science degree from the University of Oregon and Master of Science degree from Oregon State University, before getting her Bachelor of Architecture degree from the University of Oregon in 1950. She then worked for three architects in Portland and Corvallis to gain professional experience. She was licensed as an architect in 1954, the first licensed female minority architect in Oregon. Following her own architectural practice, Edith served from 1979 to 1991 as staff architect for the Oregon State University physical plant. Buildings she designed include a six-story office building in Alaska, the OSU Chi Phi Fraternity House, the popular Big O Restaurant in downtown Corvallis, the Corvallis Unitarian Church, the Oregon State University Seed Lab Building and other commercial and residential buildings. Edith was the Theta Sigma Phi 1970 Woman of Achievement, President of the Arts in Oregon Council, Chair of the Corvallis Arts Center, Board member of the Southwest Oregon American Institute of Architects, and Charter member of Citizens for Corvallis. As Chair of the Zonta Club in 1962, she initiated the Corvallis city program of street tree planting, and was active in the city’s waterfront beautification program. She donated in-kind services to the planning of the 170-acre Whispering Winds Girl Scout camp, and for five years was a member of the Linn Benton Housing Authority. 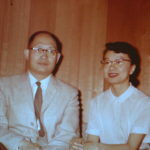 Hoya Yang was born in 1912, and came to America from Amoy, China, in 1938. From a Chinese food processing family, he had been sent here to study American food production and processing at the University of California in Berkeley, California, with the expectation of returning home. The Japanese invasion of China ended that plan, and he remained. He attended Oregon State College, receiving a PhD in Food Science and Technology, and becoming Associate Professor attached to the University’s Agricultural Experiment Station. Hoya was later appointed full professor, and Professor Emeritus of Food Science and Technology at the University. Hoya was an early advocate of the Oregon wine industry. His articles were published in the American Journal of Enology and Viticulture and his booklet Oregon Grapes for Oregon Wines was published by the University in 1959. He was one of the first speakers at the newly organized Oregon Wine Growers Association in 1969, and for many years was the official wine taster at the Oregon State Fair. Hoya also worked with Ernest Weigand on the perfection of the Maraschino cherry. Hoya was known in his neighborhood for the park-like grounds he had planted around his home and maintained until his death in 1998 at age 86. The Pacific madrone is an iconic Pacific Northwest tree. Madrone trees love the sun — they will twist and turn to find it if a competing tree tries to outgrow it. In the early Spring, it abounds with white blossoms and during the summer months it sheds its reddish-brown skin, and underneath the younger yellowish-green wood will turn a deep mahogany red during the winter months. Older trees do not peel all the way down to the ground. The bark stays and gives the madrone it’s shredded look. In the forest, it is more resistant to fire than surrounding trees and re-sprouts quickly, acting as a nurse tree during forest regeneration. Madrones are wind and drought tolerant due to their deeply penetrating root system. They attract many types of wildlife throughout the year. Bees pollinate them in the spring, and birds choose their oddly shaped tree cavities to make their nests. Birds and squirrels eat the red berries in the fall. Today, the population of Pacific madrones is dwindling due to diseases and urbanization. Madrones are not usually found in urban settings like the Yang Madrone, because they are extremely difficult to transplant, and often do not withstand disturbance of the soil around their roots.